A quick (and FREE) trip to California! I couldn't resist sharing these photos from here, so come along and let's go for some cheap free thrills! Look at this darling show called "The Girls of Seaside Cottage". Those gals in California really know how to put on the best shows. Check out that garland- boy, somebody had some time on their hands, huh? I'd better get started right away to have some in time for September. I love all the kitchy handmades; it's like bohemian princess meets 90210! But my HOA would slap me with a big 'ole fine if this were in my yard. 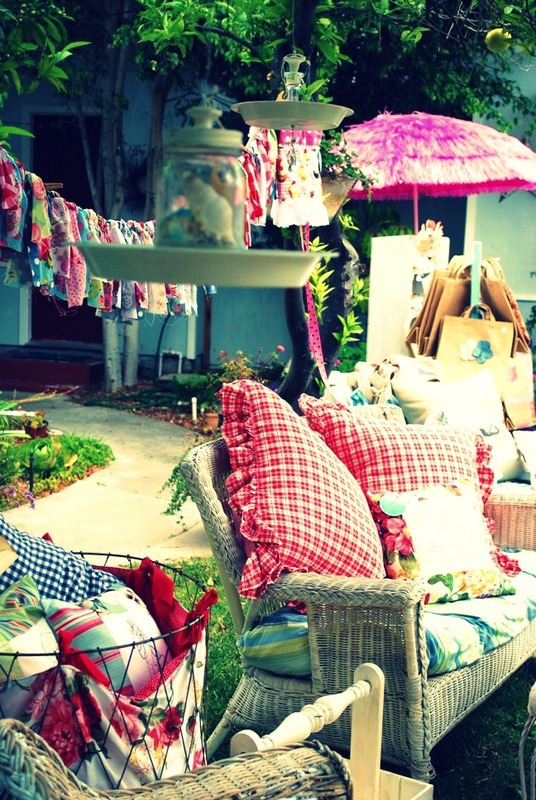 Here's another sale I'd love to shop....the Glamerella Vintage Trailor Trunk Show. Can I have one of those trailors for our show, pleeeeeze. Come on, surely one of you "Sourthern Gals" has one of these! These pic's really get my Junkn' blood pumping!